Clothes have been done, shoes we'll get to; we've even talked about a cool upcoming designer.. Oh! and makeup was discussed as well for the summer... so what haven't we talked about that a lot of us focus on and even spend hours on... or maybe just pull together frantically after many failed attempts... any guesses? Well, okay ... I just realized making you guess is kind of ridiculous considering the title says it all. Yes it's hair! Now some of us really keep in touch with hair trends and the latest hair products and hairstyles but if you are like me you might be out of the loop at times and a visit to your favourite salon might not be as frequent as you wished. So sit back, relax and let's go over the cutest cuts for 2015 shall we? It looks similar to the infamous pixie cut that a lot of stars have been shown sporting but it's a bit more flirty and relaxed. 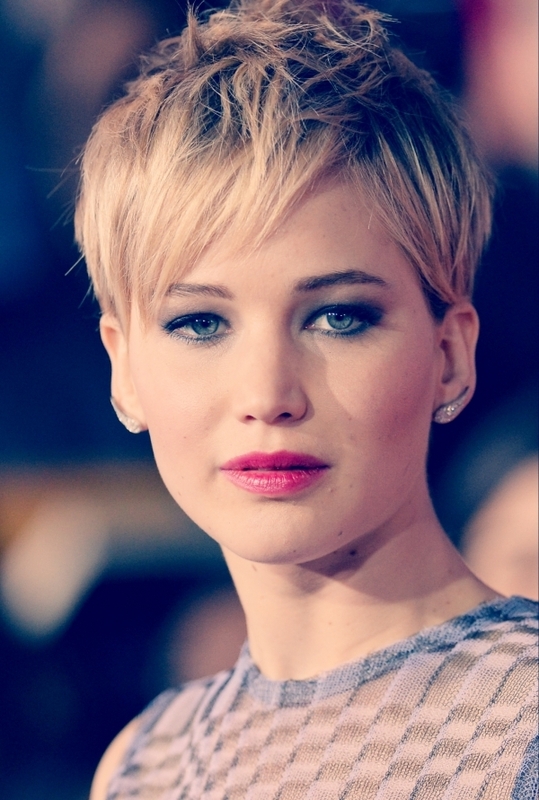 The hair is parted to the side and can be kept a bit longer and given some texture to make it more playful and fun. So straight bangs were a big hit last year as well but with a short cut it reminds me of those strong female leads in Sci-Fi films... is it just me? So this one has been quite popular even before summer began. Now not all of us can pull of this look and not all of us are brave enough to say goodbye to our looks but some women can definitely rock this look and look super cute and chic doing so. Similar to the straight bangs bob - this is a bit less experimental in terms of minus the straight bangs. Most women look super cute with side swept bangs and it's something that is super feminine as well. This cut is usually around chin level and just above the shoulders. So going a bit longer now for hairstyles... this one has longer layers that end quite bluntly and bangs are also quite sparse. It focuses more on the texture and has a more edgy, unkept look. Ok so I lied.. another short cut but this one can actually be done with longer hair as well.. but is very edgy and daring. You can pull this one off with cute curls and textures as well for the longer hair to add more drama and volume. You can't beat what always looks good and this one is the classic bob cut. No shaving, no edginess. Just super simple and sophisticated. Something that we believe will always be in style. This one is edgy, gives off an unkept vibe to me personally. Sometimes it can be fun to play around with textures and this one can add some drama to your do. Choppy layers can also be done with longer hair or short. This is another versatile hairstyle for the summer. This one screams Victoria Beckham to me every time, but it's also been quite popular this summer as well. So we've gone over a lot of shorter styles, most of the them with bangs, but a popular hairstyle is actually one of the most manageable ones. Grow out those bangs, let the layers grow out and rock em! This one actually is a very soft, angelic type of hairstyle. It's not as edgy as the some of those above and can pretty much be styled and textured to change it up once in a while. So if you are feeling safe and not up for such a big change this summer, then this is the look for you. Remember when dealing with your hair, it's important to keep it healthy and clean. So do your research whenever you are trying out new products, try to use as little chemicals as possible on your locks and a nice trim every few months will ensure a great hair day every time! I will do another post soon on great hair products and cleaning solutions.